Composants Diffusion is specialized in the distribution of genuine spare parts for bar, vending and catering equipments. Any order received before 2 p.m. is shipped on the same day. A large stock unique in the world of 600,000 references of genuine spare parts for hundreds of marks for bar equipments, catering equipments, food industry, vending machines, gathered on 10 catalogs. Delivery delay. All current orders placed before 2 pm leave our warehouse the same day. Everything is made to ship your orders from the stock as soon as possible. For export, our partnership with well-know forwarders enables us to deliver in short time..
New referencing. Gathering a maximum of spare parts to meet your requests and constantly increasing our range are a proof of the vitality and the respect that we have for our customers. The purchasing office puts its full attention on choosing authentic items thanks to the confidence of our manufacturing partners as well as quality products from selected suppliers for their rigor and the satisfaction of our requirements demanded by our customers. Prices under supervision : Our prices are not static. We immediately react according to the price changes of our suppliers, competition, improvement of our purchase conditions that gradually are better as the quantities of parts progresses . The commercial team remains in contact with you to track your progress, bring and renew the tools necessary for your development such as catalogs, CD-ROM, the Internet access code and to respond to all your needs. The integrated IT team, which strives to develop and update paper and digital media, catalogs, CD-ROM, website, tablets. The technical team provides information and helps you find the part you need when you have a doubt. It informs you when spare parts are available , the delays and remainders when needed so you can make your decisions accordingly. : Technical advice on the phone. The commercial team offers a warm and focused phone reception, and gives you all the information you need in French, Italian, English, Spanish. The reception team, carefully controls the quality of goods and puts on display. An effective team of orders preparing to ensure better responsiveness. A team of packers proceeding final inspection and suitable packaging. Composants Diffusion is at the cutting edge. Our PDF catalogs are the ‘bible for the professionals’, allowing a real technicial training thanks to their clearness and professionalism of diagrams, photos and exploded views. The website, ‘Catalogue on line’ enables quick and easy reference, using multiple search engines and exploded ,views by brand and model. You can access the price, stock, technical parameters, pictures, delivery as well as download catalogs, do your order and use our secured online payment by credit card through Sogenactif or Paypal. Our specialty for over 20 years is the spare parts for coffee machines, coffee grinders and Barista accessories. The strong partnerships with many manufacturers allow you to find the GENUINE SPARE PARTS for more than 50 coffee machines and coffee grinders of different brands.A specific center with a qualified and trained team offering a quality support. 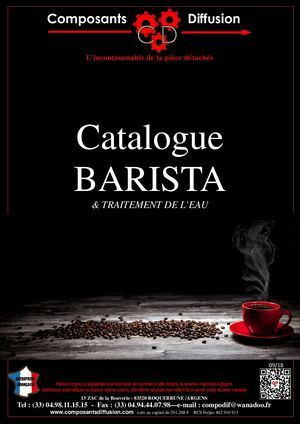 We are the official sponsor of the SCAE (Championship BARISTA France) since 2012. Catering spare parts . You will find the widest choice of genuine spare parts for most brands. The Composants Diffusion catering parts offer is over 100,000 references including 9500 pieces in stock, available in 24 hours. It is also the fruit of an experience and a partnership with more than 400 suppliers. Spare parts for washing machines, glass washers, dishwashers, is an area where Composants Diffusion is specialized since 1995. Are you searching for a spare part to your glass washing or dishwasher? You will find it easily with photo, price and availability. Ice maker spare parts, air conditionings. You will find here the spare parts and accessories fitting your needs in commercial and air-conditioning refrigeration . Vous will appreciate the wide selection of spare parts and brands by clicking the following link. Vending machines and water fountains spare parts.Find all vending machines spare parts of the 20 most important brands.Enjoy special rates on many items sold by lot in this section. A wide range of softeners. With our expertise, we offer the most suited water treatment system to your appliances (coffee machines, OCS, Laundry, ice machines, ovens, fountains ...) for all market brands, and for all your needs, be it for the taste, for the quality of the products served, or just for the lifetime of your appliances.